What is the app for? Do you have people who are important to you and who are not with you all the time? For example, do you have parents who live alone and you want to know always that everything is ok with them? Or do you have children and constantly wonder if they are okay? 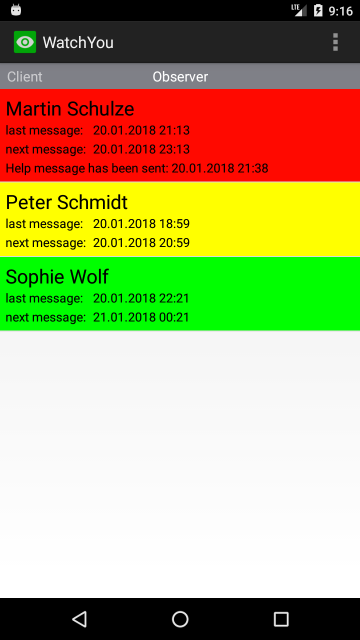 In such cases the WatchYou app can be a great help for you because with this app you can check at any time whether other persons you care about are ok.
People who are important to you use the app to periodically confirm that everything is fine with them. For this they simply touch the corresponding button in the app. This is an effort of some seconds! If this confirmation stays away this could mean that something happens which requires your attention. In such a case the app notifies you and you can initiate further steps. Imagine the following situation for example: Your father or mother is living alone. What happens when he or she falls down accidentally - perhaps losing the consciousness - and is not able anymore to reach a phone to call for help? In such a case the app would promptly notify you because the ok message stays away. Then you can start further steps and help or call for help. This is as well the big advantage of this app opposite to other solutions where people can call for help by using a help button carrying with them! In very unhappy situations people are not able to do this anymore. The app notifies you nevertheless that possibly something is not ok and you can check this then. Or you have a child which is doing a longer class trip. Wouldn't you like to know that your child is doing well at all times? 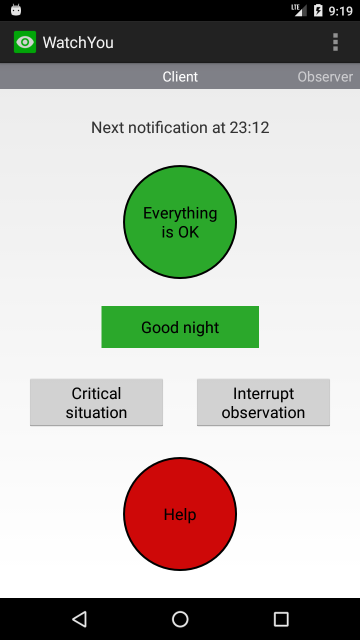 With the app your child has to confirm regularly that everything is ok. This gives you a good feeling and you don't have to be worried. Which possibilities does the app offer? In principle the app is a social media app with a clearly limited area of responsibility - the "observation" of other people who are important for you. Observation only refers to whether the person is ok or not. People who are observed are named clients in the app. The other user group consists of persons who observe other people (the clients). These persons are called observer in the app. Both clients and observers use the same app. Within the app settings it is defined whether a user is client or observer or even both. Each observer can observe any number of clients. Also, each client can be observed by any number of observers. Both sides have to accept so that a connection between client and observer is established and consequently the observation can become active. For example, when an observer wants to observe a client, the client has to agree with. Conversely, it is the same. Each person is identified by their email address. The intervals, in which the client has to confirm that everything is ok, are freely adjustable. The client also has the option to move the last possible date of the next ok message backwards or forwards in time. The first variant is useful for example when the client doesn't have internet access in the next time or no access to the smart phone or the client is in the presence of other persons, so that an observation is not required. The second variant is helpful in critical situations, for example when the client takes a shower or is cooking something and wants to send an ok message after the critical task is finished. Of course the observation can be interrupted at any time for example when the client is longer in the presence of other people. The observation will be interrupted at night by touching the corresponding button by the client in the app before going to sleep. At the next morning the next ok message is due. The respective times can be adjusted in the app settings. The prices given here are valid for Europe. If you live outside of Europe, the prices will be converted into your currency. The subscriptions can be canceled at any time, whereby the app can then be used until the end of the current subscription period. Otherwise, the subscription always automatically renews at the end of a period. Do you have questions or suggestions? Contact us.